tRNAs are specifically recognized and discriminated by several protein systems during the events of protein synthesis. For example, the aminoacyl-tRNA synthetases discriminate between the various specific tRNAs and correctly match each amino acid with its cognate tRNA. The elongation factor Tu (EF-Tu) has a strong preference for aminoacylated vs nonacylated tRNA but does not discriminate between the various acylated tRNA species. The Escherichia coli transformylase formylates charged methionine-specific tRNAfMet but not charged tRNAmMet or many other charged tRNA species. Even within a given system of protein-tRNA interactions there are some extraordinary features in the recognition process. For example, the aminoacyl-tRNA synthetases not only distinguish between tRNA species, but they also show a preference, which varies from enzyme to enzyme, for either the 2′- or 3′-OH as the initial site of aminoacylation. 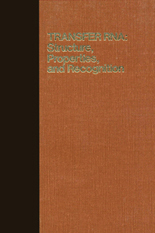 In this paper and those by Schulman, Ebel et al., and Hecht (all this volume), the question of recognition and how it is achieved are discussed. This paper focuses mainly on the recognition of tRNAs by aminoacyl-tRNA synthetases. Ebel et al. and Schulman also consider this issue. Some of the other interesting questions are taken up by Schulman and by Hecht.